More dishcloths today. These are a quick distraction from other projects I’m working on, but can’t show. First of all, I’m crocheting some top secret items for my Swap Swap Gals appointed recipient Katrina. We’re not technically swap partners since each person delivers to next down a list. Most of the projects for Katrina are crochet, but there’s also an intermediate knit piece that I’m excited to finish. Also, I’m spending some time on a picture tutorial for the Through Any Window Baby Blanket. I’ve got about half of it photographed and, as usual, I’ll have left and right handed photos included. And there’s good news about the camera: my brother had a look and ‘broke’ the lens back into place. Was that all? In any case I’m happy to get my little PowerShot back in working order! So, about the dishcloths. 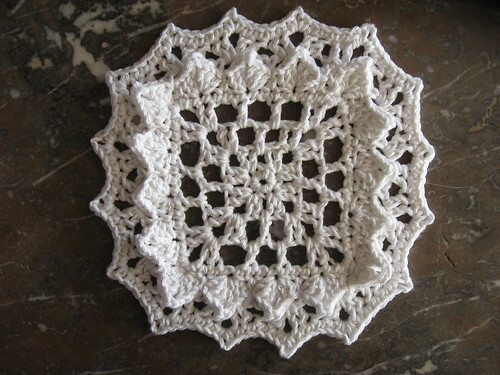 This Sunshine Dishcloth by Drew was interesting to crochet. I like the multi-layered effect and the unique shape the border forms using shells. I had to block it lightly to get the ‘pointy’ effect, but this turns out well without any help. 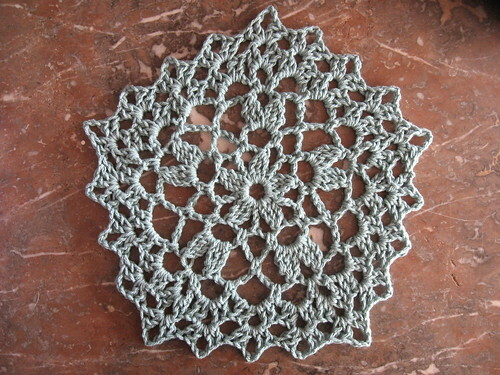 I want to make another in a variegated cotton like Andrea on her blog Knits and Knots. James G. Davis adapted this design for a twelve inch Sunny Skies Square. 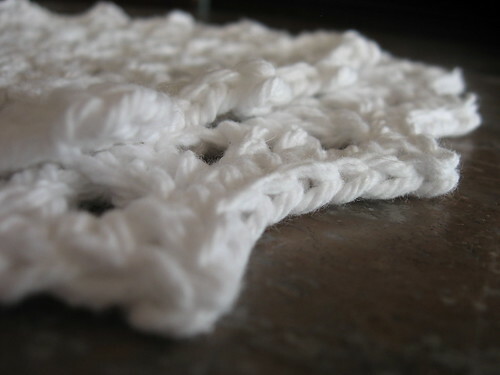 So, if you’re not a dishcloth kind of person, you could still try this pattern to include in a blanket or comfortghan. Here’s another design by Drew called the Pentagon Dishcloth that does require blocking to get the right shape. In it’s unblocked state, the pentagon looks more like a miss-shaped circle. The dishcloth is made with Lily’s in Soft Teal. (Can you tell I have a lot of Sugar and Cream in my cotton stash?) The pattern itself kept me on my toes, but I like the overall design and I learned a few crochet lace tricks along the way. The Lacy Honeycomb Dishcloth is made with Lily’s Sugar and Cream in Over the Rainbow and Hot Orange. I’m thinking that this color scheme would have worked better if I used the orange as the main color. 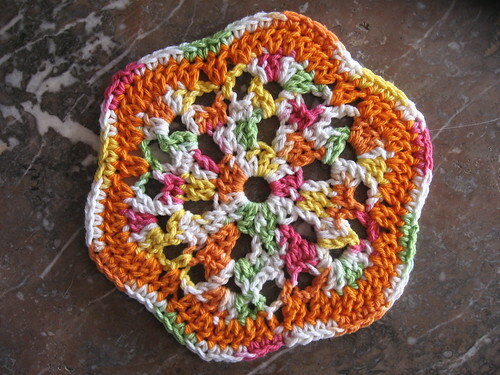 The pretty crochet design is lost in all that mishmash of color in the center. This dishcloth is on the small side (not necessarily a bad thing) but turned out to be a satisfying little project. The bumblebee moth has transparent wings and a black and yellow body that makes it look like an ordinary bumblebee. This disguise allows the moth to infiltrate a bee’s nest and lay it’s eggs in the honeycomb.